MALA GPR Australia’s Special Projects division offers specialised geophysical consultancy services worldwide. Whilst our main focus is on the implementation and application of the Ground Penetrating Radar (GPR) technology, we have 15 years experience with a wide array of geophysical methods and offer a consultancy service for high level projects that require a specialist input. With many years experience over a range of Australian and international projects, our qualified geophysicists provide full data collection, processing and reporting services and can employ a range of geophysical methods including Electromagnetic (EM / IP), Ground Magnetics and Ground Conductivity. MALA GPR Australia specialises in providing innovative and effective geophysical solutions across a diverse range of problems. MALA GPR Australia will provide consultancy services to existing MALA GPR Instrument users regardless of where and when you\’ve purchased the instrument. If you are an end-user requiring basic GPR investigation to be undertaken, we will refer you to one of our specialist user around Australia. We also provide a consulting support service to existing MALA users. If you are an existing MALA GPR Instrument user we can assist you with high level projects that you may otherwise not take on. We can provide full data processing and reporting services, and if required, provide you with a full data acquisition service. 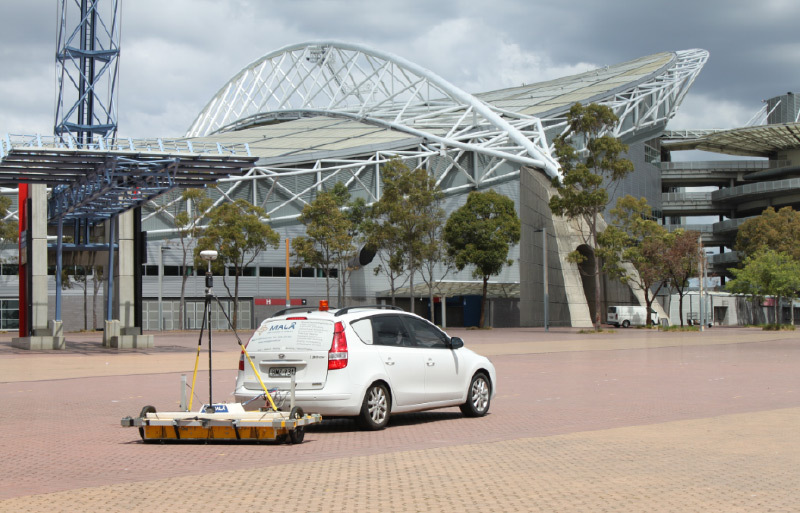 MALA GPR Australian will provide this service to existing MALA GPR Instrument users regardless of where and when you ’ve purchased the instrument. The targets for this kind of investigation are sub surface pipes, cables, subsurface drains and other areas of interest related to subsurface infrastructure. 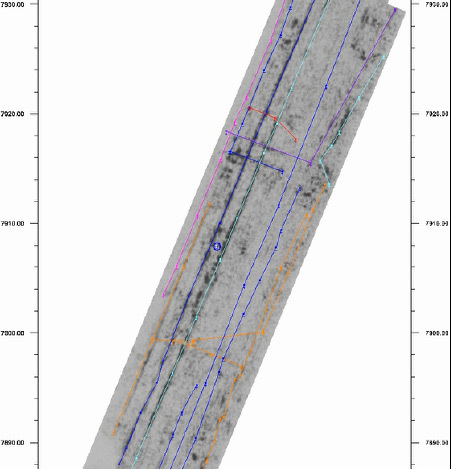 The delineation of subsurface features such as these requires high resolution data with dense spatial sampling which only few geophysical methods can satisfy. Over large industrial and sometimes sensitive sites, the instrumentation should be simple to use and be able to collect vast amounts of data in an effective time frame. Highly accurate field positioning is important for mapping the location of features and also in order to be able to reposition areas of interest for further investigation. The Ground Penetrating Radar (GPR) method fits these criteria. Plan view showing marked services over a stretch of road. MALÅ GPR MIRA system mounted on a ride on vehicle allows for fast and efficient data collection. This can include investigations for structural and engineering problems (pavement/road investigation, wall structure investigation, tunnel analysis). The targets for this kind of investigation are often thickness of asphalt or concrete cover, depth to road base, position and confirmation of reinforcing and other engineering / structural features and defects like voids or delamination of layers. Analysis of features such as these requires high resolution data to produce accurate and reliable information. Ground penetrating radar is often the only geophysical technique suitable to these kinds of projects. A range of high frequency antennas, including the 31 channel 1.3Ghz MIRA system, have been used to investigate and provide answers to a range to engineering questions. MALA GPR Australia are specialists at the investigation of critical infrastructure and can work in a manner which minimises down-time, traffic control or closures. Not limited to ground surface, MALA GPR Australia have custom built equipment allowing for investigation of walls, ceilings, tunnels and curved surfaces. Concrete road investigation showing reinforcing along a stretch of road. Geophysics can be particularly useful in contaminated land projects. Techniques measuring ground conductivity or resistivity can be used to delineate chemical plumes, identify leaching from capped sites, salinity etc. This kind of survey can be very useful to outline or overview the area of contamination and provide information to target drill holes and soil sampling. When repeated after remediation, this kind of survey can give an overview of how conditions have changed following the remediation works. Magnetic geophysical methods employ a range of different magnetometer instruments in the detection of ferrous metal objects. 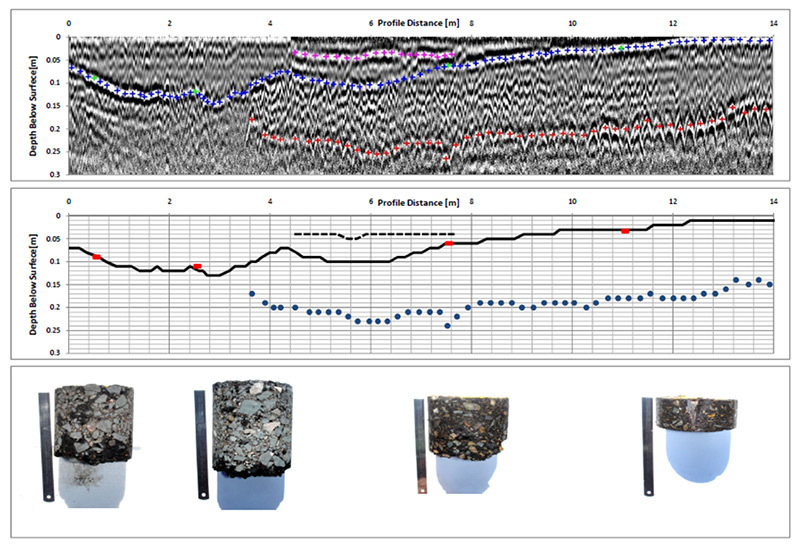 Typical applications for magnetics include detection of UXO or buried objects in a contaminated environment such as oil drums, underground storage tanks or scrap metal. MALÅ MIRA System towed behind vehicle.